A mediocre hitch bike rack can spell disaster and ruin your planned day of fun in the mountains or at the bike park. We’ve all experienced some difficulties when it comes to transporting bikes. Although biking is fun, it’s a pain to load them into a car and take their tires off. Too much work takes away from the joy of the day. Hitch mounted bike racks are supposed to help with that problem by supporting your bikes to the back of your car, where they can be easily removed and jumped on for riding once you’re at your destination. But a bad bike rack can make the bikes wobble, scratching each other, or worse, will have clamps that aren’t tight enough to hold everything in place. A bike that falls from a moving car isn’t going to be in good shape. So how can you find a good bike rack that’s worth your time and money? Although it takes some research and planning, we’ve done the research part for you! No longer will you need to settle for some half-rate bike rack that wobbles as you drive or that can’t hold a light bike in place for more than a few miles. Instead, we’ll show you all the best hitch bike racks on the market. In our guide, we’ll explain exactly what makes a good bike rack and how to tell great picks from bad ones. We’ve also got several choices that can be perfect for different, specific scenarios or needs. No matter what your fun springtime riding plans are, we can help you accomplish them. Let’s ride! Let’s go over our top choices for hitch bike racks. In general, when you’re selecting a hitch bike rack, you’ll want to pay attention to how many bikes it can carry, what type of hitches it’s good for, what the dimensions are, and what extra features it has. Don’t worry if that seems like a lot; we’ll go over everything in detail further in the guide. This quick list will provide a brief snapshot of the best hitch mounted bike racks. It’s in no particular order, but each is perfect for a certain niche or need. No matter your vehicle or safety concerns, there should be something for you here. In our reviews, you’ll find that the best bike racks usually have some excellent elements that make them stand out amongst all the rest of the competition. In general, the best hitch mounted bike racks will have good construction, be able to fit the standard kinds of hitches, and be easy to install. They’ll also likely have some cool perks, like foldable arms or adjustable clamps for holding various types of tires. We’ll go into extreme detail with each of our hitch mounted bike rack reviews. You can find which of the types you think you’ll like best and jump straight to that review, or read through them all to find out their specifications, what kind of activity they’d be good for, or how many bikes they can hold. You’ll also find out what they lack or what big flaws they have, if any. Good bike racks can be counted on to have the same core set of features: durability, adjustability, and versatility. Each of the racks we’ll look at is above many others, and their main differences come from their specialties or additional features. An important thing to know before you start looking is what you’re looking for in a hitch bike rack. This means you’ll need to measure your car’s dimensions and your hitch. Also, consider how many bikes you want to store at once and the kind of space you have in your garage; if you have only a little, you’ll want to invest in a folding bike rack, for instance. All of this preparation will help you save time and look for the exact hitch bike rack you need instead of going back and forth. Then you can enjoy the fun, healthy thrill of biking anywhere you can drive to! The Kuat Racks NV Bike Rack is a premium choice that’s going to provide you with great service for years to come. It can carry two different bikes, and its heavy, durable frame allows it to hold bikes that are quite hefty. It can take a variety of wheel sizes, so there are a ton of different bikes you can use with this rack. The bikes are kept well apart, and installing the hitch on the back of your vehicle is easy. No tools are necessary for the tightening phase of the installing process. The hitch presses down with a weight of 49 pounds for optimal security and tightness, even during the bumpier segments of a road trip. Adjusting the rack is relatively easy with the foot assist that was designed with the user in mind. Releasing bikes is easy, too, with an intuitive release button near the ratchet arm. The trail doc is an interesting addition to the rack, since it provides some great functionality away from the hitch. The doc acts as a repair stand that you can take practically anywhere, since it’s light enough for easy transportation. Once you bring it to your bike, you can make some quick repairs or adjustments and be on your way once again. It’s a great pick if you like to go off-road biking or mountain biking. It’s a good thing that the rack adjustments are easy, since the entire apparatus is actually quite heavy. This can make it a challenge for some, but we feel that the foot pedal makes up for this small flaw. Folding the rack up is going to be a bit of an effort, but the stability and sturdiness you get in return make it a small price to pay, in our eyes. While you get a lot of value from this bike rack, it is a bit pricey, and you can see what you’re paying for in weight alone. It’s a good pick if you’re looking for the utmost quality and security over the price factor. Knowing that you’re buying a bike rack that will last for years to come might be enough to justify the high initial cost, as you won’t need to replace this rack with another as parts degrade or fall out. Let’s look at the Allen Sports Deluxe Bike Rack. It can carry four bikes in total, as opposed to two, so already this is a good choice for families or if you’re planning on making a trip with several friends. The hitch can support up to 140 pounds altogether, so whether you’re mixing the bike weights or bringing four identical bikes each weighing up to 36 pounds, keep this value in mind. The long carry arms are a blessing for making sure that all four bikes aren’t constantly ramming into one another and making noise as you drive. The rack utilizes a patented tie-down system that’s unique to racks from Allen Sports. This system combines the traditional clamp tech, used by most modern bike hitches to keep tires and frames in place, with a strap that can be added and wound around the bikes, making them even more secure. When you use this tie system, be careful not to secure the bikes too close to one another, or they’ll be more likely to knock into one another as they rattle during transport. Installing the hitch isn’t totally tool-free, but it is very easy, even for beginners. The hitch is made to last with sturdy steel construction that doesn’t rust easily, although it’s lighter than you would expect. This isn’t a flaw, really, but you should keep it in mind as you drive, in case you go over any minor bumps or drops. The light weight of the hitch will let it move perhaps more than you’re used to. It also requires a really secure hitch clamp to be effective. Some hitches only need to be secured lightly; you’ll want to double-check this one’s security before you drive. This may be due to the construction of the hitch clamp itself. Whatever the case, it’s good to know that there’s a lifetime warranty in case something goes wrong. In this case, you’re getting great value for money as long as you’re willing to use the warranty, as a hitch of this price isn’t going to last as long as something like the Kuat. It may be worthwhile to pick this one up if you know that you aren’t going to be using it very often or if it’s for a one-time deal, such as a cross-country move or a competitive event. In any case, while it’s strong enough to last for some time, we don’t recommend it as a pick for a long-term solution for your bike rack needs. You’ll want to go with something with more longevity. Now let’s see about the Swagman XC Cross-Country Mount Rack. This can carry two bikes in total, although there are upgrades to allow you to switch to a larger, four-bike model. Each set of arms can carry a bike up to 35 pounds in weight, so it’s a better mount for lighter bikes or kids’ bikes. Despite this relatively light weight limit, the arms are very adjustable, even for larger tires and bikes of varying lengths and shapes. This means that if you have some more niche bike types, like a carbon-frame bike, it’ll be right at home with this hitch. Larger bikes and tires will, of course, have more difficulty than smaller bike types, due to both the weight limit and the fact that the arms can’t fit fat tires without another additional upgrade that you may not feel like spending the money for. The hitch makes use of an anti-wobble device that basically tightens the bolts more securely than some other competitors. This is good, because the tire locks themselves aren’t the sturdiest we’ve seen, and you’ll probably want to triple-check before you start on any off-road or bumpy excursion. That being said, the experience while driving is very quiet and smooth, in large part due to the anti-wobble design. The hitch is also smartly made with its center arm design folding down for really easy access. Whether this means that kids can load their own bikes or just more convenience for any loader, it’s a good feature that deserves recognition. The entire piece is also really easy to install. It’s a great choice if you have smaller or lighter bikes than most other riders. Because of its focus, it’ll be a lighter weight to lift up and down, too, so if this is a concern and you aren’t comfortable lifting heavier bike racks, you could always pick something like this one and eliminate that worry as well. The Kuat Transfer Universal Mount is another higher-quality, higher-priced hitch rack that can fit two bikes, each with a maximum weight of around 40 pounds. This is right in the middle of most common bike weight ranges for hitch racks. It has a good spread of accepted tire sizes, too, around 20-29 inches. These aren’t great for fat tires but are fine for “larger” tires that don’t quite fit the “fat” description. Even if it doesn’t fit the “fat” category, the adjustability is still valuable because it means that you aren’t locked into one specific bike type for the rest of the rack’s lifetime. This can make it a good choice if you find yourself transporting a lot of kids’ bikes or if you have several of your own for different occasions, such as a road bike and a mountain bike, depending on your mood. This versatility also means that different types show bikes can be transported together, although we do recommend driving carefully. The hitch has a handy foot pedal we really like, since it makes locking the frame and making adjustments with the rack easier and safer than crawling around underneath the bikes as they’re being loaded. This foot pedal also allows anyone, even kids, to use the rack and get their bike down. There are some upgrades available for security pins and cable locks if you’re planning on biking in areas where you’d like a bit more security. However, since this rack is already a bit high when it comes to price, you’ll have to decide if the potential risk is worth another investment. For what you get out of the box, the bikes are secured pretty well and don’t shake too noisily. Importantly, they don’t touch each other, so if you have frames that you want pristine for a show or event, this is a good choice. Due to the lack of touching, we did notice that the arms are a bit weaker than some competitor models. You won’t run the risk of the bikes falling out of the carrier or anything similarly disastrous, but you might find that you can hear them shifting as you drive. For show bikes, we recommend adding some padding or wrapping a cloth around the bikes just to be safe. While this can be annoying after a while, it’s not a large enough flaw to dock it too many points in our eyes. The Tyger Auto Deluxe Carrier Rack has enough arms to support four different bikes. These bikes can vary in weight and type, so feel free to mix and match or carry a family’s worth of bikes on this single rack. There’s some extra security afforded by this rack, thanks to its additional straps that come with the purchase. Basically, in addition to the normal arm clamps that are included with a hitch bike rack, this model comes with a safety strap that you can tie around one bike that might be a bit small for the arms or even the whole collection, if you don’t mind the frames touching one another in transit. This means that the level of security you can reach when combining the arms with the strap is above that of many competitor hitches. However, we did find that the arms alone were not as secure as some of the others we’ve reviewed. This makes the safety strap very mandatory if your bikes don’t fit perfectly into the arm clamps. Keep this in mind when you’re deciding on the bikes to take for a particular day of riding. A bike cable is also included for extra safety when you’re parked or for general driving. The arms fold up when they’re not in use for easy parking and storage, and the entire apparatus can shift downward to allow you to load the bikes more easily. This is great if you have heavy bikes in particular. The hitch is generally very easy to install, although some hitches might not fit perfectly on the first try. This may require a little creative machine work on your part or some extra weight to force the fit. Either way, it’s a bit of a flaw that you should be aware of. In general, 1.25-inch hitches fit a little better than the larger 2-inch hitches that are supposedly workable with this rack. The Tyger Carrier Rack is also the best hitch bike rack for the money, since you get so much functionality for an amazing asking price. Few other racks can boast the ability to carry four bikes at once and include accessories like the cable locks and safety straps for this kind of affordability. The fact that it’s so cost-effective and it holds four bikes makes it a great pick if you’ve got a family and everyone has a bike that they want to bring along on the summer trip. The BV Bike Hitch Mount Carrier is another rack designed for smaller, lightweight bikes that don’t go above 36 pounds per frame. It can carry two bikes in total and is built with special loops and padded arms to secure the bikes more firmly. This is great for smaller, lighter bikes since these types tend to bounce about more easily and slip from arms more frequently than their heavier counterparts. The rack makes use of anti-wobble bolts to minimize jostling and rustling, too. All of the attention to security on the part of the smaller bike types makes it a great pick if you have carbon-frame bikes or are transporting bikes for kids. Loading is made easy with its tilt-back accessibility, and it can fold up while you park or while it’s not in use. The adjustable jaws for the clamps, however, aren’t made with the same thickness of metal as the rest of the model. This means that you might find signs of rust or disrepair on this part of the hitch first, although it wasn’t something we personally were concerned with. It’s just something to be aware of while you’re loading bike; check these segments each time to make sure that nothing is wearing down too quickly. If they are starting to rust, you can take care of that with the right chemical product and a rag. Replacement parts are easily obtainable from the manufacturer in the event of damage, but we feel that this will not likely be necessary unless the rack is left in the rain for a long period of time. The biggest danger to thinner pieces on this rack is sudden swerving and turning, which could cause stress on these segments. You should be driving carefully with bikes on the back of your vehicle anyway, though. In addition, the hitch is another misfit in terms of actually working with the prescribed sizes that it claims to fit. You’ll have to work to get it, but once it’s attached, you’ll find that everything is very secure, especially in comparison to cheaper hitch racks. Altogether, this is a minor flaw when compared to its litany of perks, such as the reflector plate that’s set against its back for greater nighttime visibility. It’s a good hitch rack if you’re transporting kids’ bikes, certainly. The Yakima Products Bike Rack is a bit of a different style than we’ve seen so far, which you’ll notice as soon as you look at it. It utilizes a pivoting wheel hook to make sure that bikes are secure and stable without letting their frames touch. Since it can carry two bikes, each with a maximum of 60 pounds, this makes it a great pick for show bikes or for taking premium bicycles to and from a location that might have a lot of bumps or winding roads. The adjustable racks are excellent for any number of bike varieties and types, including ones as small as carbon frame models to the larger, mountain-bike types that you find in a lot of off-road racing competitions. In the spirit of extra security for more expensive bikes, the purchase comes with some cable locks, so you can be at ease if you step away from the hitch for a short while. Alternatively, these locks provide even more security if you’re afraid of the bikes jostling on the road to your destination. There is the question of longevity. While the rack as a whole is durable and well made, there are a few spots where plastic screws or caps were used in place of metal versions. This was clearly a cost-cutting measure that doesn’t appear to largely affect the rack, at least at first. We have found that after some use, the plastic pieces tend to wear down more quickly than the other segments. This might mean that you’ll have to find a replacement for the rack, or contact the manufacturer for replacement screws. The rack as a whole is quite pricey, so we were surprised at this apparent cheapness. It’s not a deal breaker by any measure, but if you’re looking for the ultimate in premium quality there are other racks that don’t use plastic anywhere on their frame. Next, let’s take a look at the Overdrive Hitch-Mounted Rack. This can carry two bikes at a time and has arms that are capable of supporting actual “fat” quality tires that are around five inches in diameter. This means that larger bikes are quite at home in this rack, particularly since it can support bikes up to 60 pounds in weight. These two factors alone should make this rack a top contender for your purchase if you have heavier bikes or models with fat tires. The wheel clamps are adjustable, though, so if you have smaller bikes but like everything else this rack has to offer, you’re still in luck. Anti-wobble screws are integrated into the design to reduce shaking during transit, which will afford a quieter journey and greater peace of mind concerning frame-touching. Altogether, this rack has one of the most secure sets of clamps we’ve seen on hitch racks. This is extra important for the fat tire acceptability, since these tires can be so difficult to keep in place with their extra mass. Even if you don’t have bikes with fat tires, you might find that you appreciate the extra security afforded by these clamps. The rack is really easy to install and is built with a quick-release system and a tilting pivot. 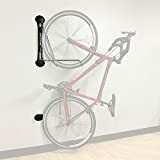 This lets you remove the bikes at a lower level than their mounted height and do it without having to struggle against the arms or adjust them beforehand. This added convenience is a great system that makes actually using the rack easy, which a lot of racks forgo for security purposes. Even with the quick-release system, your bike should be quite secure and stable during any car trip. The packaging that comes with the purchase is of a poor quality, which may seem like an odd complaint. This made putting the rack together for installation more of a hassle than it needed to be. In addition, although the rack comes with a reflector panel for nighttime visibility, we found that the plastic covering was very cheap and won’t last for long if it’s banged against something. Altogether, though, these are minor caveats concerning an overall excellent hitch rack. The Leader Accessories Hitch is a two-bike rack that can carry bikes heavier than any we’ve looked at so far: up to 80 pounds per unit. This huge weight capacity is going to be a great advantage if you’re looking to load bikes that can really tear up off-road trails, such as durable mountain bikes and racing bikes made for heavy-duty tracks. Because of this weight capacity, you’ll notice that the rack itself is rather heavy and quite unwieldy. Installing the rack might come with some difficulty, since its alignment is hard to manage, and your vehicle might not be the perfect type envisioned by the manufacturer. It should still work with most automotive hitches of the appropriate size, but we wouldn’t be surprised if you had to put in some elbow grease to get everything locked in. Despite this, the rest of the rack is made with excellent qualities and features to make it worth the effort and money. The arms can be tilted down for easy loading and removing, and when the rack isn’t in use, it can be folded up against your vehicle, even if it is a bit heavy. No-wobble bolts are included in the rack’s construction to more firmly secure heavy bikes. Shifting bikes of that weight might cause damage to the vehicle or each other, so we’re glad to see that they took the effort to make sure they could handle everything a pair of 80-pound bikes entails. Those bolts might rust a little more quickly in comparison to the rest of the rack, but some occasional maintenance and cleaning (which you should already be doing) will take care of those issues. Overall, we like it as a heavy-bike solution, assuming you don’t mind putting your back into installing the rack securely. Finally, let’s look at the Hollywood Rack. Hollywood racks are well-known in the biking community for their durability and good quality, and we can see that reflected here. This rack can carry two bikes of a median weight: up to 50 pounds. You can install it all without a bunch of complicated tools, and the rack integrates some no-wobble tech to keep the bikes locked in place and quiet as you drive. There are security cables that come with this purchase. These add some great value to the overall asking price, which isn’t too bad considering the high-quality of the rack. The cables can be used for their intended anti-theft purpose or to make extra sure that the bikes mounted on the rack won’t be going anywhere. The wheel clamps are adjustable for a variety of different bike types, although it doesn’t accept fat tires. Excluding that rare type, you should find that every kind of bike you might want to take out for a spin is workable with this hitch rack. The fold-up aspect of this rack is very effective, going nearly flat against your car when it’s set. This might be an issue, hypothetically, as it could bang into your back window in the event of an accident. But there’s no denying that it’s handy when you need to fit the car into a crowded garage or parking space. The wheel holders are adjustable, and we found that no matter what their setting, they gripped the wheels well enough that you should be satisfied with the level of security you’ll be getting. Some cables are included with the purchase for either an extra layer of traveling security or for peace of mind if you are away from your vehicle for a short time. This rack is very heavy; be prepared to use your muscles as you install it or lift it up to fold against your car. In addition, the adjustable arms are tough to actually move and manipulate. Both of these aspects are results of how durable the rack is. You’re making a tradeoff, ease of use for sturdiness and a long lifespan. Because racks can already cost quite a lot, we found that the tradeoff was worth it. If you’d rather have a durable rack that takes a little effort to move around than a cheaper but easier model that you’ll have to replace in a few years, you will too. Now that you’ve seen all of the best hitch bike racks on the market, we’re going to explain how you can tell when a bike rack is worth your money. There are several key aspects that are common among great hitch racks and a few more that are nice to have but aren’t strictly necessary for a good product. The top features to look for in a hitch bike rack are adjustable arms, dimensions to fit your needs, foldability or collapsibility, durable construction, and a lock that fits 1.25 or 2-inch hitches. These features will let you use most hitch racks for most vehicles and can be considered the key features that mark versatility or widespread appeal. On the other hand, the perks that are great to have but aren’t truly necessary are safety straps or extra cables, no-wobble bolts or similar tech, foot pedals for adjustments, tilt-down functionality, and four bike slots for double the usual number of bikes. We’ll explain how each of these factors can benefit you below. Most racks have adjustable arms between a certain range of tire sizes, such as 2-4 inches or so. Others will be lower or higher. It’s rare that bike hitches have arms that can take “fat” tires with diameters of 5 inches or more. Adjustable arms are a very important factor to look for when you’re finding a hitch bike rack. Why does this matter? Not all bike tires are the same and finding a hitch rack with arms that are perfect for your bike’s tire diameter is going to be practically impossible. Instead of finding the perfect match and limiting your use of the hitch to one size of tire, adjustable arms allow you to use the same rack for a variety of bikes. However, if you do have fat tires of those specifications, you’ll need to make sure that your target hitch’s arms can support your bike, or you’ll have wasted a bunch of cash for nothing. Thankfully, the tire range that hitches can support can be found on the box in a physical store or on any product page. This is considered a critical technical aspect, so make sure to double-check before you buy. This refers to both the dimensions of the hitch rack and the dimensions of your car. Obviously, it’s imperative that you pick a rack that can fit your car. Most of these racks are going to be fine for standard-size SUVs or pickup trucks, but you should double check just to be sure. When it comes to the best trailer hitch bike rack, try to find a rack that’s short enough to not add a lot of extra drag to your turns. Trailers are already difficult enough to manage without adding a hitch that’s really long and can make driving dangerous or more complicated. Go for shorter, stockier racks as opposed to longer, lankier ones. 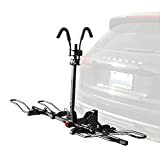 This may mean that you won’t find a four-bike rack to be the best trailer hitch bicycle rack. The next major aspect to consider when finding the best bike carrier is foldability. This kind of functionality is important because you aren’t going to want to disengage the rack every time you need to park your car in the garage or take up more space on the road of your neighborhood. When the bikes are off, there’s no reason for the rack to be extended. Foldable bike racks can become drastically smaller thanks to their ability to press up against your car. This will allow you to store the rack and keep it attached to the hitch when it’s not in use, saving you time and valuable garage space. While most bike racks have a foldability aspect to their designs, there are a few here and there that lack this crucial feature. If you find that space is at a premium when it comes to parking, this perk is a must-have for your bike rack. Heavier bike hitch racks will obviously be harder to lift up and secure on your car. If you find that you have trouble lifting 50 pounds or more, you’ll need to find a rack that is lighter so that you can reliably maneuver it to take advantage of this feature. Next, check to see how durable the rack is. This can be done by examining the product description and searching for terms relating to the kind of material used for the rack’s construction. Most bike hitch racks are made from steel or similarly-tough metal, so you should have no problem finding such a rack anywhere you look. However, when it comes to screws and pins, things aren’t so simple. Some hitch racks have screws and pins that are made of lesser materials. This isn’t always a deal breaker, since you can usually get cheap replacements relatively quickly. However, metal screws are always better, because this usually translates to better security and a tighter fit for all the relevant pieces of a rack. If at all possible, go for an all-metal model when you choose your hitch bike rack. But if you have to get one that has some plastic pieces, it’s not the end of the world. Most of the more premium or higher-priced bike hitch racks will forgo plastic entirely, although this is not always the case. The lock for the hitch needs to be able to take the hitch size your vehicle is equipped with. Since you probably don’t have a very specific, unique hitch with its own precise dimensions, you can safely bet that the right hitch size for your vehicle is between 1.25 and 2 inches. This means that you should find a hitch rack that’s rated for hitches that size and nothing else. Some racks are only suitable for 2-inch hitches, which will limit your options somewhat. However, there are plenty of racks that can be purchased for variable hitch sizes or are even adjustable to some degree. Basically, this is just another aspect you need to double check as part of your measuring before you make any final purchases. The best way to handle all of these aspects is to investigate the car you’ll be using with the hitch rack and checking these dimensions out for yourself, writing them down, and then start looking for the best bike rack hitch. Because most of them are made for most hitch-ready vehicles, you shouldn’t have any trouble finding an acceptable model for your vehicle of choice. Now let’s get into the extra features to check for. 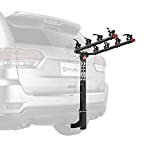 These are excellent additions to any hitch bike rack, since they immediately improve the security potential of any rack. Safety straps add an additional layer of stabilization to any bikes locked in the clamps. Most safety racks can be tied to straps according to your specifications so you can use them for one bike, in particular, that might be a bit too small for your clamps. Or, you can wrap the strap around the entire collection to keep them all tightly held together. Obviously, don’t use this method if you’re worried about the frames scratching each other as they travel. Along the vein of extra safety materials, some hitch racks come with safety cords or belts that are meant to be added to the bikes to protect them against theft or vandalism. They usually come with a lock or key and are great for protecting your bikes if you have to leave the vehicle for a short while. While these are nice to have, they’re not necessary and should be looked at as some extra value for a purchase you were already going to make for other reasons. If you really want safety cords for anti-theft purposes, but they don’t come with your top bike rack pick, you can always buy them separately for a low cost and add them to your kit. A lot of the best hitch bike racks come with some kind of anti-wobble tech or addition, usually in the form of super-tight screws or a pivoting head that rides with the movement of your vehicle. This basically just prevents the bikes from wobbling and shaking, which provides three benefits. First, it makes them quieter as you drive. If you’ve dealt with wobbly bikes before, you know that listening to them constantly rattle can grate on one’s nerves very quickly. Anti-wobble additions are good because they stop bikes from rubbing or scratching against each other, too. Finally, these prevent bikes from possibly shaking out of the clamps if they weren’t secured properly; this kind of mistake can happen if you drive over terrain where there are a lot of smaller bumps in a short period of time. No-wobble tech or pieces aren’t needed, but they definitely drive the value of any particular hitch rack up in our eyes. It’s probably more necessary if you’re going off-road driving for mountain biking or something similar. If you plan to stick to the paved roads, however, it’s less needed and just a nice feature to have. These are excellent if you hate having to bend down and mess with the tight controls or adjustment levers of some bike racks. These let you use your foot to make adjustments, lower the hitch rack, or release the bikes depending on its exact function. The function of the foot pedal will differ based on the particular rack, so pay close attention to product descriptions to make sure that it’s included to do what you have in mind. This feature can be particularly useful if you can’t handle the pressure and weight requirements to adjust a lot of modern hitch racks. Consider who’s going to be using the racks and taking bikes off and on before you decide that you need a foot pedal for certain. A tilt-down feature is along the same vein as the foot pedal, in that it makes it easier to load or remove bikes from the hitch rack. The tilt feature needs to be reset after you’re done, though, because it can drag against the ground as you drive away if you’re not paying attention. In general, most bike racks won’t be so high off the ground that this is a necessary feature, but it can be handy depending on the particular user or vehicle. The tilt-down feature also needs to be checked frequently to make sure that it all locks back into place before you start driving or when you’re folding the rack back up against the car for parking purposes. This is a joint that is susceptible to rust and other damage, so checking for these problems every so often will save you from a headache later on. Most hitch bike racks can only carry two bikes side-by-side. Of course, if you plan on taking more bikes, you should look for a four-bike hitch rack to take everything at once. Be aware that these racks are almost always heavier than their two-bike counterparts and may require a little more effort to install and adjust. With four-bike racks, things like the tilt-down functionality and anti-wobble tech are more needed than with two-bike racks. You’ll be dealing with more bikes at once, so the better quality of rack you get, the better. You should consider getting a more premium rack than not, since it’ll likely come with these types of perks right out of the box, including things like safety straps to really make sure that jostling won’t be an issue. You should also check the dimensions very carefully when it comes to four-bike racks, since not all cars are big enough to carry that many bikes. The smaller the car, the more carefully you should consider this aspect. Most four-bike racks aren’t going to have the space to support fat tire bikes, although there are exceptions to this rule. Usually, you’ll be more able to find two-bike racks that can fit in fat tires, however. Above all, get the hitch bike rack that’s right for your needs, regardless of what the reviews say or what’s currently the most popular on the market. These are tools that are supposed to help you and your bikes, but they won’t be of much use if you get the wrong rack that doesn’t fit your bikes’ tires, for instance. In addition, we recommend paying attention to price and considering the length of time you plan to use the rack. When it comes to price, it’s always better to purchase a more expensive hitch bike rack that will last you for years to come rather than to buy a sub-par bike rack for less of an initial cost. This is because a cheap bike rack is likely to fail and cause trouble the more you use it. This is both bad financially and is also possibly dangerous; you’re towing bikes at the back of your car, after all. Getting a good rack that you don’t have to replace in a year is likely to save you money overall and better protect your bikes and vehicle. Overall, picking the best option for your hitch bike rack will end up satisfying you more than settling. Settling with safety equipment is never a smart idea, anyway!We hope that this guide has given you the information you need to find the best hitch bike rack for your needs. Knowing ahead of time what to buy and why it’s worth the cost is the best method to save time and money and guarantee satisfaction with your purchase. Whether you’re planning on mountain biking or taking a scenic ride with the kids in the park, we hope you have a great time with your new bike rack! Don’t forget your water bottle!